We were left with a curious situation when last we left the Planet of the Apes. The planet had been destroyed by a nuclear holocaust. Still, we had to get another movie to capitalize on what can now be called a franchise. However, the planet was destroyed! How can you get another sequel when the planet was destroyed? Well, no worries...they merely have to rework a few details and we get Escape From Planet of the Apes, which may be the world's first reboot of a series (reboot in that we have the same characters/story but get to start afresh). A spacecraft is spotted off the California coast. It's recognized as one that was sent a few years earlier. The military brings it ashore and then is stunned to see it was piloted by apes! 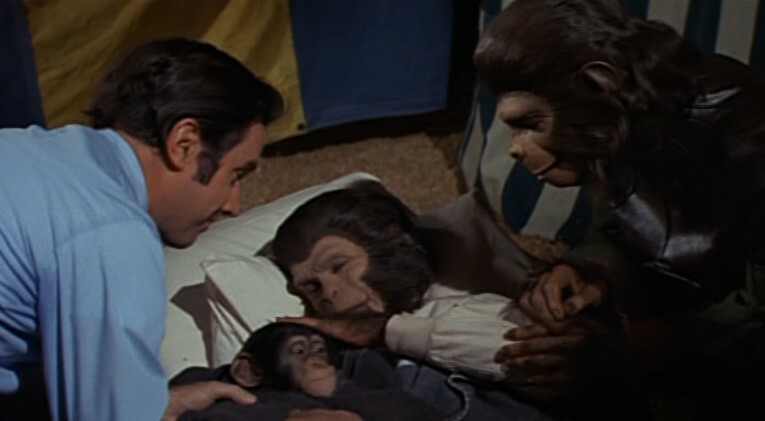 Three specifically, our old chimpanzee friends Cornelius (Roddy McDowall), his loving wife Zira (Kim Hunter), and a new character, Milo (Sal Mineo). Instantly they are whisked off to the Los Angeles Zoo where Milo is promptly bumped off by a depressed gorilla. However, this was after two scientist, Drs. Lewis Dixon (Bradford Dillman) and Stephanie Branton (Natalie Trundy) discovered that the apes can talk. To uncover the truth, the President (William Windom) creates an Inquiry to find what they are, how they got here, and what their intentions are. The public is charmed by the "ape-o-nauts" and Zira & Cornelius become the toast of society, giving speeches and discovering the quirks of prehistoric human living (at least pre-historic from their perspective). All the fun and games come to an abrupt end, however, thanks to the President's Science Advisor, Dr. Otto Hasslein (Eric Braeden). He believes the chimps are the harbingers of death for humanity. His concern and fear grows with three events: first, Zira's drunken admission that they have seen the destruction of the Earth after a war between gorillas and humans, second, hearing from them the story of the rise of the planet of the apes, and third and most dangerous, the fact that Zira is pregnant. Hasslein believes the only way to stop the future from being dominated by the apes is to kill the baby and stop Zira and Cornelius from having another. Later, when an orderly innocently teases Zira by referring to her unborn baby as a "little monkey" (monkey being a derogatory term to them), Cornelius in his anger accidentally kills him and they flee into the night. Now believing them to be dangerous, the apes become hunted just as Zira goes into labor. Dixon and Branton believe Cornelius didn't mean to kill the attendant. They take them Branton's friend, circus owner Armando (Ricardo Montalban), who not only loves animals but who was helped by Branton in delivering the first chimp ever born in a circus (something that Armando is prone to go on about). There, Zira is able to give birth to Milo, named after their fallen comrade. Hasslein realizes that a chimp in her condition couldn't travel far, so he orders a search of every zoo and circus in the area. The plans to take Zira, Cornelius, and Milo to Florida and have them hide in the Everglades is scuttled, so they are advised to travel to the port and hide there until they can be smuggled back to the circus. However, Hasslein in his now-fanatical determination, finds them and ruthlessly exterminates them and is himself exterminated by Cornelius. We end Escape from Planet of the Apes with a short epilogue where Armando closes his circus and tells a little chimp just how smart his parents were...and the chimp begins to say, "Mama" again and again. Escape From Planet of the Apes has quite a few things going for it. First, it has a healthy dose of humor within it, almost all of it gentle. I point to two moments. The first is when Zira and Cornelius are brought before the Inquiry. The members are naturally amazed to hear Zira speak. One of the members asks if the male can speak. Cornelius rises and responds dryly, "Only when she lets me". This brings immediate laughter from the audience, concluding with Zira herself laughing and embracing her wedded husband. The second moment of gentle comedy comes in the montage of Cornelius and Zira finding themselves celebrities, with perks like free lodging and wardrobe. It is good to have light moments where the audience doesn't have to ponder the deeper story about tolerance and fear. Instead, we can concentrate on a rather humorous situation of apes being just like us and even then, we can see how humans treat each other. We see this when Zira addresses a Women's Club, urging greater equality in marriage (although one wonders whether in that marriage she, not Cornelius, is the dominant one). Another strong quality is in the performances. Zira is the dominant figure in Escape From Planet of the Apes, and Hunter gives a brilliant performance. Under her, Zira is both strong and naive, mixing the comedic elements along with true heartbreak. McDowall also has wonderful moments, especially whenever Zira or their child are at risk. I figure it takes a strong actor to play such an odd premise with a perfectly straight face, but both Trundy and Dillman created sympathetic characters who were friendly towards the chimpanzees. Montalban had a relatively minor role (only appearing for about ten minutes at the most), but he also in his brief screen time showed a caring individual who knew the chimps were not going to harm them. Finally, while Jerry Goldsmith's score to Escape From Planet of the Apes isn't as iconic as the one he wrote for Planet of the Apes, he creates music perfectly in tune to the story (no pun intended): providing light music for the more humorous moments but bringing the sadness and tragedy of the ending to the forefront. Curiously Escape From Planet of the Apes is the first of the Ape films to have closing music; perhaps not important in the great scheme of the series, but still an interesting tidbit. One of the qualities Escape From Planet of the Apes has is that it not only works on the basic level of the story shown, but also on a deeper level. First, you have the spoofing of celebrity culture that I wrote of earlier. Second, I don't know if it's been commented on, but Cornelius' irritation and anger about being called a "monkey" could be a subtle reference to how humans use terms to demean others, such as those used against African-Americans, Jews, or Hispanics. By having him react so strongly about being referred to as a "monkey", could it not work as well when "the other" is called a derogatory term? The film also addresses a sadly common human reaction to anyone who is different: fear. It is this fear of 'the other' and how they will affect humanity that Hasslein's character captures. Hasslein's paranoia about the chimps that have not harmed anyone, a point made clear to him by The President, will brook no opposition, and in his mad desire to alter history he may have unwittingly aided it. Paul Dehn's script for Escape From Planet of the Apes may not have been consciously echoing the story of Oedipus, but like in the Greek tragedy, the character's efforts to change the future only bring about both the future they sought to change and their own destruction. His story is leaps and bounds that of his previous effort in the Apes saga, and it was probably enhanced by the fact that he wasn't as encumbered by the preceding film as he had been before. Escape From Planet of the Apes isn't perfect. There are many points of logic that are hinted at but never fully addressed. For example, if the ship the chimps used to go into space was Taylor's from the first film, how did they manage to fish it out of the lake (or for that matter, learn to operate it so quickly)? The character of Dr. Milo (played by Mineo) dissapears so quickly one wonders why he was there in the first place (I suspect Mineo was not eager for more Ape films, which would make him a silly Sal. However, I digress). One thing that did throw me off was when Hasslein got his just deserts: seeing the blood jump onto the camera itself comes as a shock, making the entire scene more effective in drawing us in. However, I wonder if it was intended to be graphic and/or startling. Escape From Planet of the Apes works primarily because we care about the characters. We've come to know Zira and Cornelius (maybe even identified with their innocence about human culture and their abiding love for each other). With that emotional involvement, we want them to make it. We know Cornelius well enough to know he did not intend to kill anyone, making the plight of everyone even more tragic. Under normal circumstance I would bemoan the fact that Escape From Planet of the Apes violated one of my Golden Rules of Filmmaking: Never End Your Film By Suggesting There Will Be A Sequel. However, in this case I will cut it a little slack for two reasons. One: if the film had ended where we thought it had, it would have been as especially heavy ending where we would leave the theater extremely sad and depressed. Therefore, by putting in that brief epilogue we end with a sense of hope. Two: after two films where they had to come up with rather elaborate ways to keep the story going, this was a much better and more logical way to leave that door open than what we've been treated to. As it stands, Escape From Planet of the Apes manages to tell an original story while building on what has come before. It has moments of humor, of tenderness, of tragedy--in short, a remarkably 'human' film. I agree that the acting is outstanding! I think Bradford Dillman has always been an underrated, underappreciated actor than he gets credit for. And we do get to see 3 of the actors from this movie in the next sequel, "Conquest..." Ricardo Montalban does seem to have a slightly bigger, although more impotant role as Milo`s surugate father-figure. It`s just sad that this wonderful actor doesn`t get a signifigant amount of screen time in "Part 4." Also, Roddy McDowall returns as the grown-up Milo, later to call himself Caeser. Even Natalie Trundy returns in "Conquest." However, this time she doesn`t play the human Dr. Branton but an ape named Lisa, a potential love interst for Caesar. I know this review was on "Escape From" and not on "Conquest." Maybe I should have saved my rearks until then. Finally, I just want to say that although I absolutely LOVE all 5 of the original "Ape" movies, which I grew up watching (but definately NOT the one with Marky-Mark! 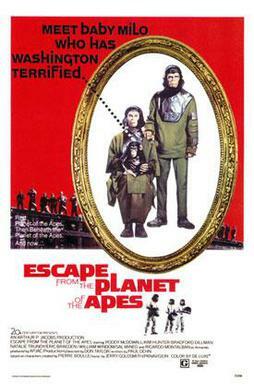 ), next to the original "Ape" movie, this one is most likely my favorite! It certainly adds quite a bit of a "human" element to the ape characters and, in fact, to the whole series of "Ape" movies as a whole!